Your company's cash flow forecast is the fuel that keeps things going and your business growing. The money coming in gets allocated to your employees, suppliers and other expenses. If you don't know what the future holds, then you'll have a hard time planning your investments and taking advantage of promising opportunities. The cash flow forecast shows you estimates of your incoming revenue for a certain period. Typically, you have a short-term forecast that gives you visibility into the near future and a long-term view that assists you with larger plans. QuickBooks can help you calculate expected cash flow. Use this process to put your report together. Please note that this report type is currently only available in QuickBooks Desktop Edition, not QuickBooks Online Edition. Choose the "Company & Financial" option. View the report that QuickBooks puts together from your receivables, payables and bank accounts. You can adjust this report based on specified periods, compensate for customers that you know are going to miss their due dates, and shift the date range. If the report doesn't seem realistic, review the information that you have in your QuickBooks account. You may have missed an important purchase order, invoice or another detail that makes a big difference. Compare your projection to previous cash flows with the help of a Statement of Cash Flows. Go to the Reports menu and click "All Reports." Select the option "Statement of Cash Flows." This report shows you the actual cash flow that you had over the specified period. The historical information will help you understand how your forecasts fall into a certain range, the factors influencing your profits and losses, and how you can adjust your business activities to improve your cash flow. 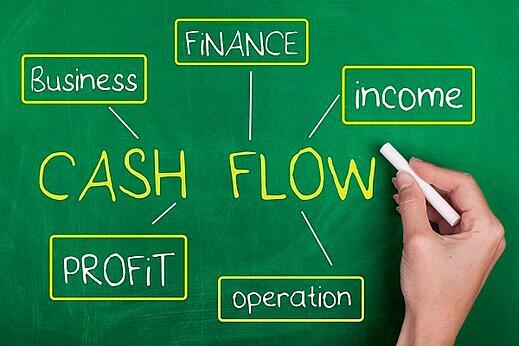 QuickBooks also has a Cash Flow Projector feature that is optimized for short-term forecasts. You get a good look at the next six weeks of your company's financial future, which works well when you're ensuring that all the bills and employees will get paid in the next month. Go to the "Budgeting and Planning" option in the "Company" menu. Input your starting cash balance. If you're not sure what that is, either estimate the number or look at your past month to get a baseline. Put your predicted cash receipts into the Cash Inflows section. Do your best to include all revenue sources so you can get a fairly accurate picture of your cash flow. Start with the steady income, and add in any payments that are likely to process during the six-week time span. Type your business expenses into the Cash Outflows field. You should already have your regular monthly costs in QuickBooks, but make sure you don't overlook one-time fees and those that recur on a quarterly or annual basis. Look at the report and see where your business cash flow ends up over the next six weeks. When you're putting figures into the forms on this tool, click "Preview" to see the ways that your projections adjust. You can use this functionality to see what happens when certain deals go through, drastic changes occur to your expenses, or an emergency situation requires more overhead. These powerful tools in QuickBooks help you stay on track with your company growth plans. Make sure to check them often, especially when you have unexpected expenses or successes.